In The Essential D. G. Jones, volume editor Jim Johnstone presents a selection of the most important writings of Douglas Gordon Jones, one of the few of Canada’s great lyric poets to expertly straddle the line between the modern and postmodern era. Known for his confident and elemental lyrics, and subtle shifts in diction, tone and voice, the poetry of D. G. Jones offers a portal to the natural world. Though initially his poetry tended toward formality and rigorous control, Jones’s style gradually evolved to become looser, more instinctual, given to linguistic flexibility and visual experimentation. The Essential D. G. Jones celebrates this poetic transformation, presenting the most important lyrics from all stages of Jones’s career, along with a few, never-before published poems to round out the collection. The Essential Poets Series presents the works of Canada’s most celebrated poets in a package that is beautiful, accessible and affordable. The Essential D. G. Jones is the 14th volume in the series. In the latest in its outstanding ‘Essential Poets’ series, publisher The Porcupine’s Quill presents a concise but grand retrospective in The Essential D. G. Jones. Indeed, unlike much of modern poetry’s stuffed-to-the-gills allusions and references (classical and pop-cultural alike), Jones’s poems utilize such devices sparingly, with exception of the poem ‘Odysseus’— for obvious reasons, given its title. 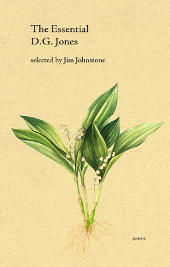 When Jones does use literary references, it’s often to deliver vivid imagery, as in ‘lily-of-the-valley in a glass / stems tangled like Ophelia’s hair’ (from ‘Spring Flowers’), or in describing sun and flowers as ‘Nanabozho’s gift’ (a reference to an Ojibwe creation myth, from ‘The Perishing Bird’). Jones uses human creations to illuminate nature and the way human beings relate to their environment. Deceptively simple at times, Jones’s poems traffic in subtlety, as if they were a series of still lifes or sound recordings layered atop one another, slowly giving up their secrets, as in ‘Winter Comes Hardly’: ‘winter is boredom / the slow shift of the light / filtered by shutters, the late afternoon / light under eaves, in the weathering / grain of the shingles’. Despite his fondness for nature as a touch-point, Jones shows a number of diverse styles; those more interested in poetic wordplay will appreciate poems like ‘The Pioneer as Man of Letters,’ in which Jones gives creative expression to the outdoors using an obtuse alphabetic formula. Douglas Gordon Jones was a Canadian writer, translator and critic. Born in 1929 in Bancroft, ON, he studied English Literature in university at McGill and Queen’s. He continued his career in academia, teaching at Bishop’s University before settling into a post at the Université de Sherbrooke. While there, he co-founded a bilingual literary journal ellipse: Writers in Translation (1969-2012), the only magazine of its kind in Canada. 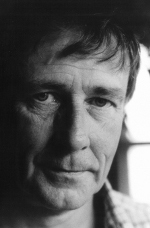 Jones was the author of ten books of poetry, and won the A. J. M. Smith Award for Poetry (1977), the A. M. Klein Prize for Poetry (1989, 1995) and the Governor General’s Award, once in 1977 for his collection of poems, Under the Thunder the Flowers Light Up the Earth, and again in 1993 for his translation of Normand de Bellefeuille’s Categorics: 1, 2 & 3. In 2007, he was appointed an Officer of the Order of Canada. Jones passed away in March 2016 in North Hatley, Quebec. 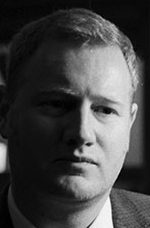 Jim Johnstone is a Canadian writer, editor, and physiologist. He is the author of four books of poetry: Dog Ear (Véhicule Press, 2014), Sunday, the locusts (Tightrope Books, 2011), Patternicity (Nightwood Editions, 2010) and The Velocity of Escape (Guernica Editions, 2008), as well as the subject of the critical monograph Proofs & Equational Love: The Poetry of Jim Johnstone by Shane Neilson and Jason Guriel. He has won several awards including a CBC Literary Award, Matrix Magazine’s LitPop Award, The Fiddlehead’s Ralph Gustafson Poetry Prize and This Magazine’s Great Canadian Literary Hunt. Currently, Johnstone is the Poetry Editor at Palimpsest Press, and an Associate Editor at Representative Poetry Online.